We have been invaded by cowboys…the injuns can’t be far behind…I always liked the Indians better anyway, mainly because they were better looking, and a bit dangerous. Oo-er. We’ve had a donation of probably a couple of hundred cowboy novels – fabulous! I’m sure there’s a good market for them. Some series and some classics. We had a music event at the bookshop last night, and the singer picked one up and read a bit aloud to us – very entertaining! So pack your Colt 45 (it’s OK, I know nothing about guns), don that stetson and tie your horse to the railing outside – with our half price offer they are currently just 75p each, fill your boots! Cowboy boots, of course. Elizabethan lady at Kenilworth market today! 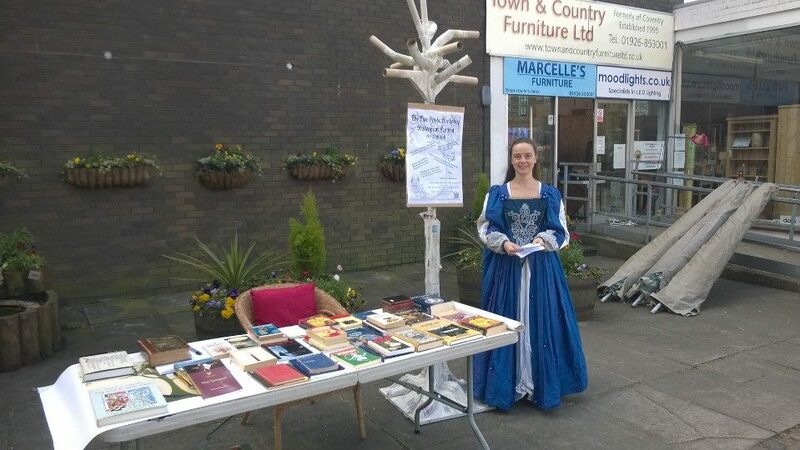 Come and say hello to Vicki, who is at Kenilworth Market promoting our Shakespeare Festival in Elizabethan dress (which she made herself!). Vicki has done most of the organising of the festival, and her hard work is not always carried out in authentic costume, but is always accompanied by a smile. You can book for events there at the stall. She will be there until 1pm today. The lovely Wes Finch came to the Tree House on Saturday morning to record a song video, and here is the result. Rob of Redwood Photography filmed it, Michael McEntee of the Big Comfy Bookshop (soon to be opening in the new Fargo Village development in Coventry) arranged it all and did the interview, and Richard Harrison kinda produced the whole thing. It was lovely having them all in the shop and listening to Wes sing and talk about the books he’s enjoyed, and the video is fab! A few customers were lucky enough to be around as it was happening, but if you’d like to hear some live music at the Tree House, we have Inlay tomorrow night (Tuesday 15th) and Jez Hellard and the Djukella Orchestra on Thursday (17th), both will be wonderful! £6 and £5 respectively, a bargain for top quality live music – do come along. Nick Drake is, for my money (not that I have much, but don’t let that get in the way of a good story! ), the greatest singer/songwriter Britain has produced. He left only three albums when he died tragically young in 1974, at the age of 26, but those three albums are all sublime, and part of the tragedy is the loss of all the music we might have had. To top it all, he was a Warwickshire boy – born in Burma but brought up in Tanworth-in-Arden, where he is buried. He sold very few records in his lifetime, but since then has become something of a cult figure, admired by musicians and listeners alike, the world over. If you don’t know his music, do explore on youtube – my own favourite is probably Day Is Done, if you need a place to start, my favourite album Five Leaves Left, but start anywhere. Michael Burdett is a composer who once worked for Nick Drake’s record company, and owns an unreleased recording by Nick Drake. He decided to take the recording around the country and play it to 200 people, photograph them listening to it, and record their reactions in a book. He shared the track with all sorts of people, famous and uncelebrated, and the results were often unexpected and profound. Ahead of a tour of dates around the country, including the Edinburgh Festival, Michael is coming to the Tree House on Friday 2 May to talk about the project. He contacted the Tree House, having seen us retweeting the Strange Face posts on Twitter, and a beautiful relationship has developed! We are thrilled to be hosting this event, and even more excited to be the first to be doing so. Surely a must for Nick Drake fans, and for anyone interested in popular music and the power of music in our personal lives and as a tool for connecting people. Michael is a warm, funny, engaging speaker with a passion for Nick Drake’s music – I think it will be a fab evening! Do spread the word and of course come along yourselves. Friday 2 May, 8pm, tickets £7. We are looking for people who would be willing to collect some flyers from the shop and push them through letterboxes in Kenilworth. If anyone is willing to do this for their own street, do get in touch or call into the shop. 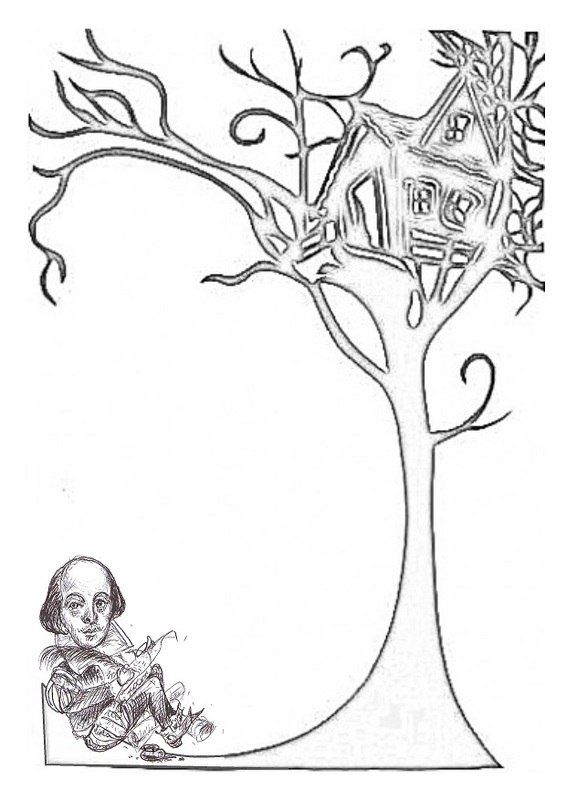 We are highlighting the Shakespeare Festival, as well as trying to get the word out generally about the shop, so really need this done in the next week or so – the sooner the better! 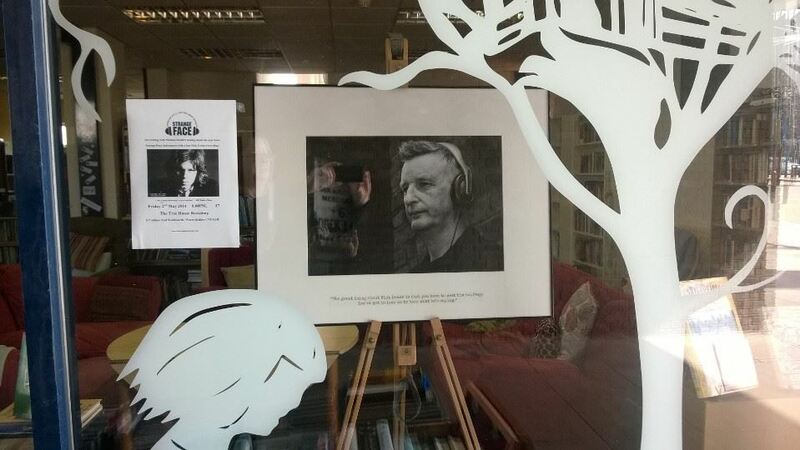 Email victoria@treehousebookshop.co.uk if you can help. Thank you! 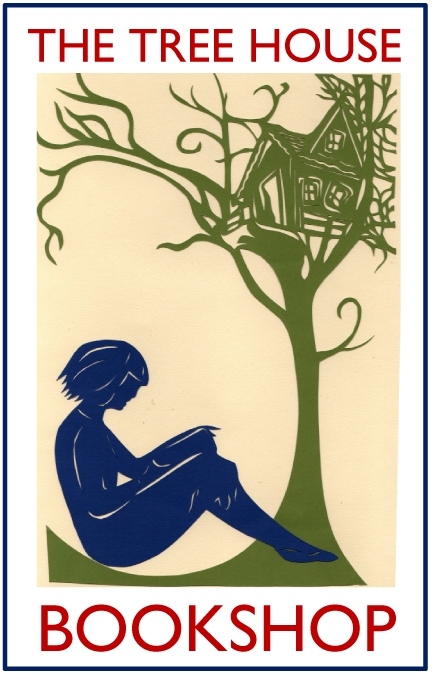 We have some wonderful events coming up in the next month at the Tree House – but no one is booking up to come to them. This is worrying, as without a good response to our events, the Tree House won’t see its first birthday at the end of July. We have live music from Inlay on 15 April; Inlay are a fabulous four-piece acoustic band, calling in at the Tree House as part of a national tour. It’s a real privilege to have them play in Kenilworth – please do spread the word, even if you can’t come or if this music is not your sort of thing. On 2 May we have Michael Burdett coming up from London, where he is a composer (he has written a number of theme tunes for well-known television programmes, including Masterchef), to talk about his Nick Drake project, Strange Face. He took a lost Nick Drake recording around the country, playing it to people and recording their responses, which he has turned into a book. Apart from being, in my opinion, Britains’ greatest singer/songwriter, Nick Drake grew up in Warwickshire, so he is a local hero! Between these two events is our own week-long Shakespeare Festival, with author Simon Andrew Stirling talking about his book Who Killed William Shakespeare? and then returning to give a session to GCSE and A level students, helping them to ‘crack’ Shakespeare; Noël Butler, who is a dance expert who has advised numerous costume dramas on television and film, giving Elizabethan dance lessons; Warwick University Shakespeare Society will be giving performances of Scenes and Sonnets from Shakespeare; Warwick University scholar Thomasin Bailey will be giving a talk; Sam Holley Horseman of Dramalings will be leading children’s drama workshops on Shakespeare; and there will be films, challenges in the shop and more. Details of all these events, plus an 8-week Mindfulness course, forthcoming papercraft workshops, Crazy Kiln sessions, lectures, film club and more can be found on our Events page above or on our Facebook page. If you are planning to come to anything, please email events@treehousebookshop.co.uk or call into the shop or telephone 01926 856843 to book. The survival of the Tree House depends on people coming to events; if we are not offering events that you would like to come to, let us know! But we are not currently making enough money to survive, which may simply suggest that Kenilworth does not want a venture like ours – but I think many people would enjoy our events, we just need help getting the word out. The books are going well, but booksales alone are not going to meet our overheads, which are high. I leave you with a bit of Inlay to whet your appetites – told you they were fab!